While visiting family in San Francisco, I visited some of the city’s public artworks by Ruth Asawa—one of the artists featured in NMWA’s exhibition Pathmakers: Women in Art, Craft, and Design, Midcentury and Today. Living in San Francisco for most of her adult life, Asawa worked as an artist, arts educator, and arts advocate. Dubbed the “Fountain Lady,” Asawa created major public artworks in prominent tourist areas. 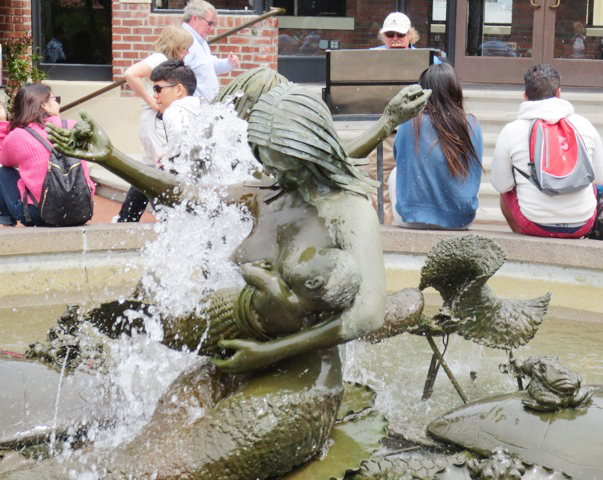 Situated in Ghirardelli Square, Andrea (1968) depicts two mermaids surrounded by frogs, turtles, and lily pads. Strikingly different from the abstract wire sculptures for which Asawa is best known, Andrea was Asawa’s first public commission as well as her first major representational work. Asawa believed the whimsical fountain would tap into the dreams of both children and adults wondering what lays beneath the water’s surface. The fountain’s plaque tells the story of how Lawrence Halprin, a landscape architect for the square, preferred an abstract work and fought to have Andrea replaced. However, the public united behind Asawa, and the sculpture remained. The San Francisco Bay and Bay Bridge serve as a dramatic backdrop for another fountain by Asawa, Aurora, located at 188 Embarcadero. Water flows from the top of the wheel-shaped steel sculpture and around its perimeter before splashing into a blue-tiled pool. Aurora is based on Asawa’s folded paper forms—an important part of her artistic vocabulary. She learned origami as a child and was encouraged by one of her Black Mountain College professors, Josef Albers, to explore the technique further. Throughout her life, she used paper for a range of artistic and educational projects. Redding School, Self-Portrait (1984), located in Father Alfred E. Boeddeker Park, is a bas relief sculptural wall made of glass fiber-reinforced concrete. 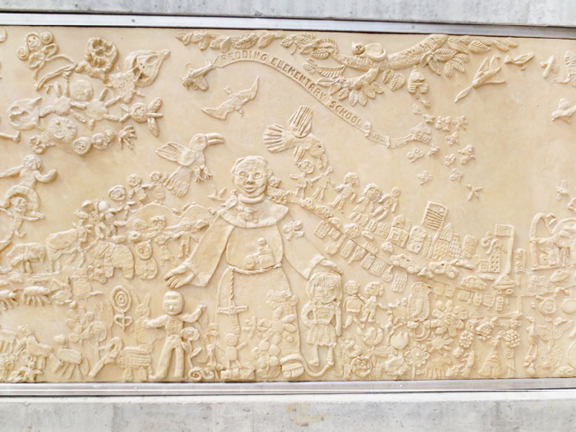 The mural depicts a prominent public servant in the city’s history, Franciscan friar Boedekker, surrounded by children, houses, airplanes, and animals. For this work, Redding Elementary School students made their own sculptures out of baker’s dough for Asawa to assemble into one complete mold. The project reflects Asawa’s commitment to encouraging children in the arts; in the late 1960s she and her friend Sally Woodbridge developed an innovative program through which children could learn directly from artists. Later, she helped establish a public high school for the arts. Another work, Origami Fountains, consists of two sculptures. As its title implies, the lotus bloom shape of each sculpture was inspired by origami—particularly appropriate given the work’s location in Japantown. The distinct sculptures are situated on a bed of large flat stones embedded in cement and surrounded by a circular multi-tiered stone bench. When compared to the sleek and modern Aurora, Origami Fountains seems more organic in form and finish. Visiting Asawa’s public works gave me a greater awareness of her breadth, talent, and creativity. Given her connection to the city, it isn’t surprising that each work reflects not only her unique artistic vision but also a sensitivity to place, setting, and audience. 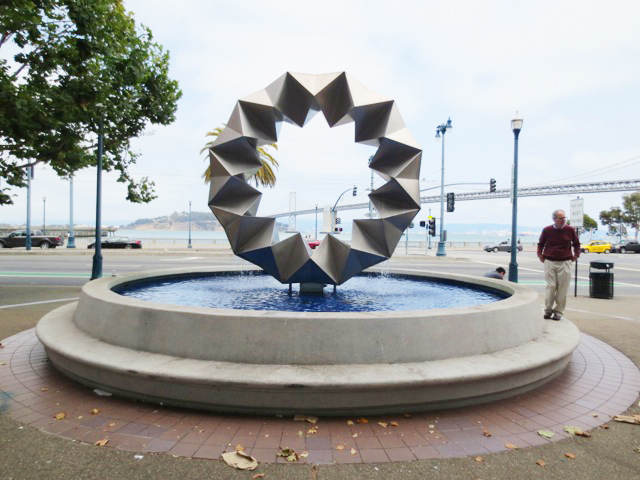 Asawa created nine public artworks in San Francisco—each worth a visit. —Ellen Pollak is the foundation and government support officer and national and international committees manager at the National Museum of Women in the Arts. 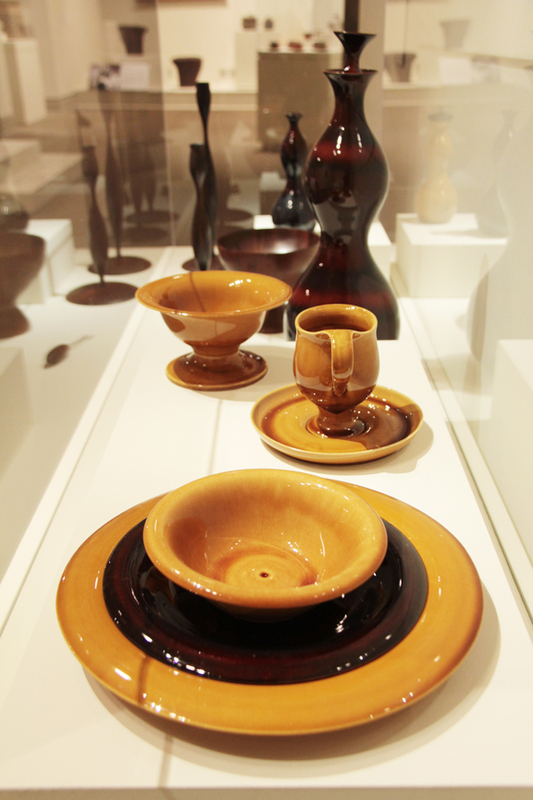 Impress your friends with five fast facts about designer Eva Zeisel (1906–2011), whose work is on view in Pathmakers: Women in Art, Craft, and Design, Midcentury and Today through February 28, 2015. Hungarian-born Zeisel made a name for herself in Germany and Russia before settling in America in 1937. Early in her career, she apprenticed with a master potter and became the first female “journeyman” in the Hungarian Guild of Chimney Sweeps, Oven Makers, Roof Tilers, Well Diggers, and Potters. Zeisel’s Ted Talk recalled the “welcome” present she received on the first day of her job in a male-dominated Hamburg pottery shop. “Colleagues thoughtfully put on [my] wheel . . . a very nicely modeled natural man’s organs.” Zeisel’s blasé removal of it from her workstation garnered the attention and respect of her coworkers. While most of Zeisel’s curvilinear designs recall the human body and intimate interpersonal interactions, she also created works that evoked Hungarian folk art birds. 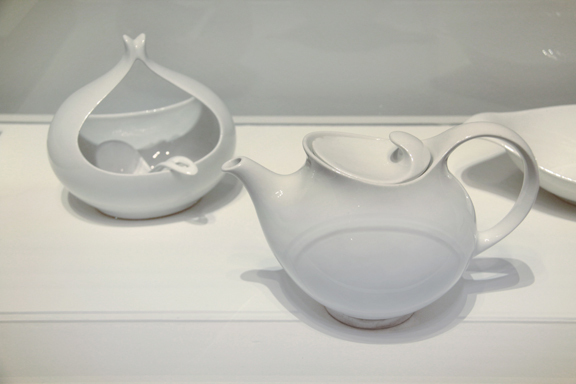 In 1942, the Museum of Modern Art (MoMA) and Castleton China commissioned Zeisel to create modern china for mass production. Her resulting designs were featured in MoMA’s first one-woman exhibition. Zeisel’s works have since been sold by Red Wing Pottery, Hall China Company, Crate and Barrel, and Design Within Reach. Zeisel’s “Town and Country” line for Red Wing Pottery included biomorphic salt and pepper shakers sometimes referred to as “Shmoos.” These pieces share the name and shape of cartoon creatures developed by Al Capp. Capp’s Shmoos are gentle, low-maintenance beings who reproduce quickly and are considered delicacies.